Filled with fresh intelligence features, the new Ranger DXi's are not only efficient but also comfortable to operate. Scroll down the page to take a bigger bite of the Rangers's characteristics! The Ranger DXi series rigs feature a cabin with extremely low noise level, onboard diagnostics, Circulating Shank Lubrication System, and even 120 less hoses than before – just to name a few of the novel, efficiency-boosting details. 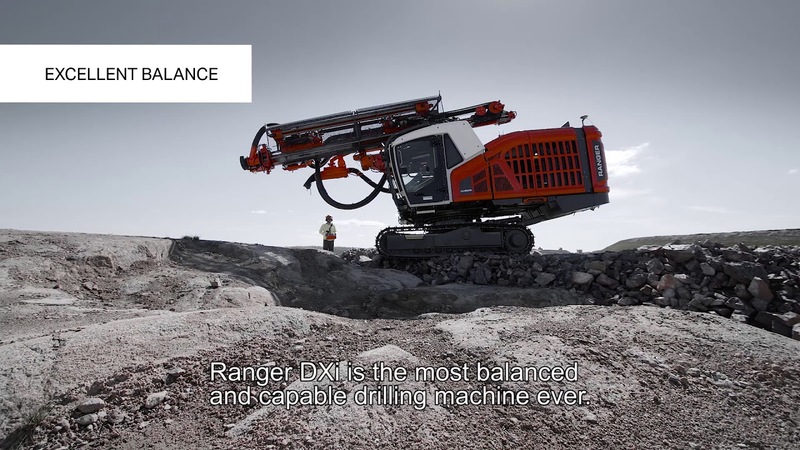 Together with the most powerful rock drill family – Sandvik RD920 series – the new Rangers will make lucrative drilling as safe and as comfortable as it can be. All the Ranger DXi series top hammer surface drill rigs feature a revolving superstructure. Thanks to its 290-degree reach enabling drilling coverage of 55 square meters, you'll save time and minimize the need to reposition your rig. Despite the rig's ability to rotate, its counterweight structure ensures stability by maintaining weight opposite the boom. Ranger DXi rigs are extremely mobile, thanks to a low center of gravity and high tramming power. In addition to the benefits owing to the revolving superstructure, new Ranger rigs are equipped with an extra tilt joint to enable the best reach also in vertical up-hill drilling. Our latest DXi rigs introduce the new Sandvik iCab, designed to improve operator ergonomics and minimize noise levels. The cabin's new user interface has been developed based on feedback from customer trials. We have reduced the noise level inside the cabin to a quiet 73.5 dB. The cabin is also designed to provide a clear and unobstructed view of the drilling area, further improving overall operation safety and operator comfort. The spacious iCab also has room for a trainer behind the operator seat, enabling fast and easy learning. We have turned our vast experience in surface drilling into intelligent features that will improve your drilling results. Naturally, the new Ranger series is equipped with the latest versions of Sandvik on-site solutions. Hole Navigation system (option): Fast and accurate drilling navigation and improved drilling result. Accuracy +/- 10 centimeters/4 inches. Surface model and drilling plan can be used concurrently. Driller’s notes (option): Measurement-While-Drilling( MWD) option can collect data during drilling. SanRemo Premium (option): Wireless data transfer. Driller’s office (option): Fast and easy drilling plan creation and MWD data analyzing. Boost your surface drilling performance with our new rock drill family. We’ve developed a trio of Sandvik RD920 series rock drills for different rock tools and hole sizes. These ideal matches will improve your drilling power, increase your productivity and reduce your costs. T51 rock tools and 89–115 mm hole sizes. Ranger DXi rigs are equipped with a novel feed system featuring a carousel-type rod handler and GT60 tools as an option. The linearly moving retainer allows you to drill 1 ft deeper than before.